As heads of government, democratically entrusted with safeguarding the welfare of all Venezuelans, Chavez and Maduro bear overall responsibility for the economic crisis, but they are not alone. Surely it was a mistake to follow the risky politics of all previous governments by maintaining the dangerous dependence on the export of petroleum and failing to take timely and effective measures to diversify the economy, ensure food security, achieve a prudent self-sufficiency in the production and supply of generic medicines, etc. They made the naive and perhaps understandable mistake of relying on customary international law and relevant treaties on freedom of trade. They naively relied on the benefits of globalization, without sufficiently taking into account their vulnerability in case of an economic war, financial blockade and sanctions as had already caused chaos and suffering in Cuba, Chile, Nicaragua and Iraq. 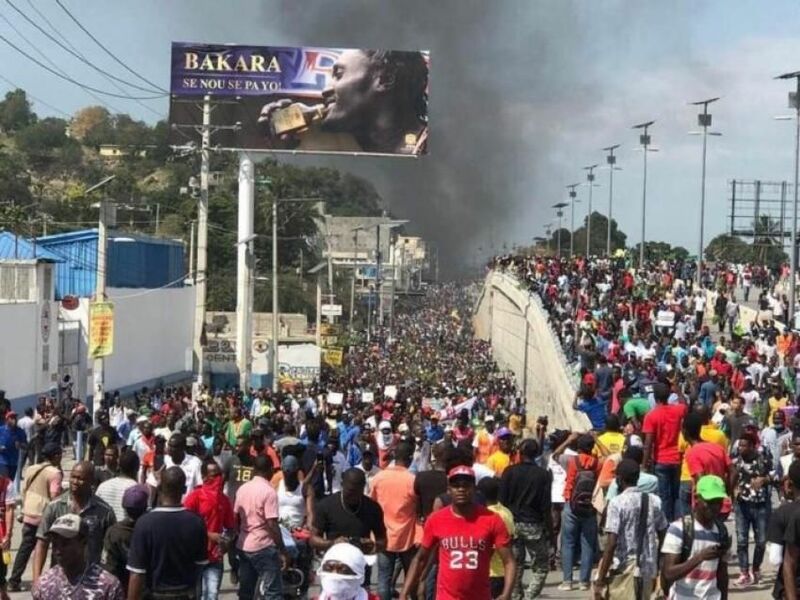 Mass protests and a general strike against growing poverty, corruption, and demanding the resignation of President Jovenel Moïse have shut down Haiti for the past two weeks. This mass movement is a direct continuation of the general strike that erupted last summer against proposed increases to the cost of fuel as well as the mass protests that took place last November in relation to a corruption scandal involving PetroCaribe funds. While the opposition is responsible for the deadly violence which has plagued the country since February 2014, Western media continue to accuse the democratically elected government of Nicolás Maduro. Since 1998, the Venezuelan opposition has consistently rejected the results of the country’s democratic elections. There is a single exception: it recognized the legitimacy of its own victory in the constitutional referendum of December 2, 2007, something it won by less than a one percent margin. The right has been strongly opposed to the legitimately elected governments of Hugo Chávez, in office from 1999 to 2013, and that of Nicolás Maduro, in office since April, 2013. All means have been used in attempts to overthrow them: coups, political assassinations, sabotage of oil installations, economic warfare (since 1999), calls for revolt and media smear campaigns. On March 15th Venezuelan President Nicolas Maduro addressed his military. Mindful of the recent CIA/bankster putsch in Ukraine, he warned the right-wing fascist thugs who have incited violence in the country over the past two months, “Prepare yourself. We are coming for you.” He then played John Lennon’s Give Peace a Chance. Praise, especially when empty, is often a way of dismissing a revolutionary historical figure more than preserving his legacy. That is what Lenin said about Marx: by making Marx into an icon, people had castrated and corrupted his thought. Sometimes the thing we call “media bias” isn’t about what a given piece of journalism explicitly says about the world; it’s more about the assumptions that must be taken for granted. Question those assumptions and the whole thing starts to fall apart. For those many who identify with a progressive or liberatory politics, 2013 will be remembered as a year where two recognized leaders of the Left passed away. For those of us living in a land of economic austerity and political atrophy, seeing a country demonstrate that there is an alternative remains an indispensible component of our long-term struggle to rejuvenate our society. Mérida, – Brazilian daily O Globo, reporting jointly with Guardian journalist Glenn Greenwald informed today that according to the leaked National Security Agency (NSA) documents, the United States has also been spying on Venezuela’s petroleum industry. The information comes as governments confirm that whistleblower Edward Snowden has accepted asylum in Venezuela.